When it comes to PWCs, Lake Havasu, Arizona is the Mecca. An unexpected boater’s paradise, Steve travels through the Mojave Desert to check out the 2016 IJSBA World Finals and hooks up with an owner’s ride on a slick new Sea-Doo GTX-R 230. Mike takes a Skeeter 1910, powered by Yamaha’s new F200 outboard, for a spin and on Footitis we check out a 1997 Cruisers 4270. SeaStar’s Optimus 360 Joystick control is the star of PowerLines. Mike takes you exploring on BC’s spectacular Sunshine Coast. Meanwhile, Steve heads to Central Florida to profile a 2017 Tahoe 1950 with Mercury power and, on Footitis, reviews a 2004 Regal 2450. For My Boat, Mike installs a set of Lumitec underwater LED lights. Mike returns to British Columbia’s Sunshine Coast and manages to fit in some time for fishing. Steve profiles the new Starcraft MX 25 R and Mike will show you an affordable classic boat, a 1964 Greavette Sunflash. On Power Lines Steve takes a look at Portable Power options on a Zodiac Cadet 230 Aero: a 4-hp Mercury and a Torqeedo T1003. Steve heads to the Port of Orillia to find out what makes Chris-Craft owners tick. Later, he tests Yamaha’s entry into the rec-lite PWC category, the EX Deluxe WaveRunner while Mike takes a 2007 Doral Elite 265 BR for a test drive on Footitis. Learn how to upgrade your batteries on My Boat. Steve’s buddy joins him to spend a few days exploring the Trent-Severn Waterway on a Princecraft Quorum 23 pontoon where they take over control of the Peterborough Lift Lock. Later he heads to the Rideau River to profiles a 2017 Carver C37 while on My Boat it’s Mike shows the good, bad and ugly of fuel and other hoses. Mike spends the day at this prestigious show then heads back to spend time with three of the top wooden boats from the show. Steve heads to Captiva, Florida for the exclusive Yacht Expo where he gets a first look at the brand-new Sea Ray 460 Sundancer and its sister ship the 460 Fly. On Footitis we look at a used Cobalt A25, while on My Boat, Mike tackles repowering a centre console with a Mercury Verado 175. Steve loads up his family and heads up Lake Huron to discover the beauty and vastness of the Great Lake. The crew heads from sunsets and beaches of Grand Bend to Tobermory, a fishing and scuba diving hotspot, where Steve gives both a shot. Later he’s in Indiana with a fish pro to look at the redesigned Smoker Craft 162 Pro Mag and on Footitis gives a 2013 Crownline 21SS a run. On My Boat,On My Boat, Mike takes on a major project, repowering a centre console with a new Mercury Verado. Steve and his pal go on a GPS scavenger hunt from Barrie to Kingston and up to Huntsville on a pair of Yamaha WaveRunners chasing Geocaching clues. Mike is in Missouri to team up with a pro fisherman to showcase a new Tracker Pro Team 175 TXW with a Mercury 60 hp outboard. On My Boat, we follow a unique and massive project: adding a whole new stateroom on an older Silverton! Mike heads to Prince Edward Island to explore the waters, both salt and fresh around the island province. Steve puts a 2017 Princecraft Xpedition 200 with a Mercury 200 through its paces on Power Profile and reviews a 1999 Sea Ray 500 Sundancer. On My Boat, we strip the old bottom paint and upgrade with Interlux MicronCSC. Mike wraps up his tour of PEI and reviews a used Rinker Captiva 266. Back in Arizona, Steve tries out some new moves on Sea-Doo’s new Spark Trixx. On My Boat we install synthetic cockpit decking on an older cruiser to give it a modern look. Policing the waters is a tough job but it’s even more complex along the border. This week Steve rides along with the RCMP and gets an inside look at the joint effort with the US Coast Guard known as “Shiprider”. Then he takes the all-new AR195 jet boat from Yamaha for a high-powered test drive. 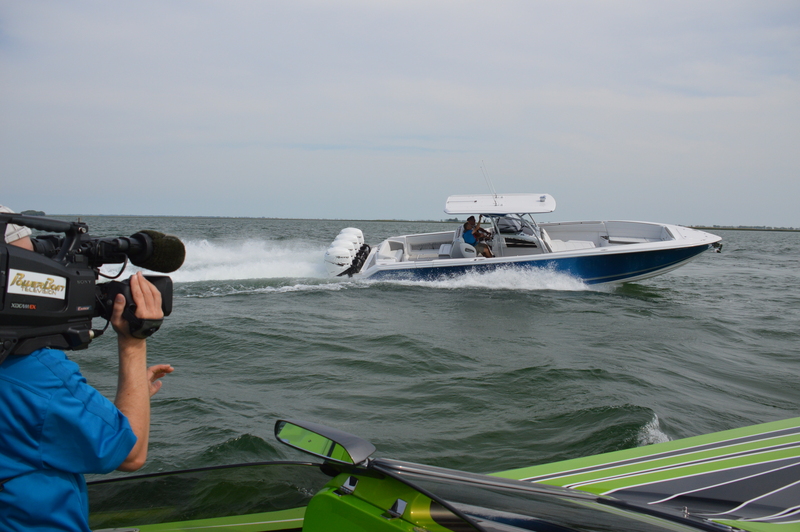 Mike highlights the amazing power of Seven Marine 627 outboards on PowerLines. My Boat, Steve rolls up his sleeves to install a new distributor in a MerCruiser 7.4L. It’s hard to believe, but the pontoon boat turns 65 this year! Steve looks back at the evolution of the pontoon from its humble beginnings to the luxurious, high-performance machines they are today. Then he gets a look at Hull #1 of the largest offering from Cruisers Yachts, the 60 Fly before going back in time with a 1966 Chris-Craft Constellation for Footitis. On My Boat, a new hand crafted wood boat gets the latest power from MerCruiser with a 6.2L DTS. Do you ever wonder where ships crews receive their training and begin a career on the Great Lakes or high seas? Mike takes you behind the scenes at Georgian Colleges Marine Training and Research Centre. On Power Profile, Steve takes the all-new Boston Whaler 230 Outrage for a test drive. And on My Boat, Mike adds the latest in Mercury digital controls and systems to the Clarion Wood Boat project.